Freestanding double sided sound absorbing dividing screens to help mask and screen noise from office staff working in close proximity to each other and for large open plan offices. Ideal for offices and other noisy workplaces. All screens are easily linked to form dividing walls. Choose from 20 different colour fabrics. Screensorption acoustic screens have exceptional acoustic performance. Supplied as double sided acoustic units with an internal sound absorbing core. These have two sound reducing functions. It reduces direct sound transmission from one work zone to another and it absorbs noise, which reduces flanking sound reflections into adjacent work areas. These sound protecting screens can also be linked together to form a continuous screen or enclosure using a simple linking facility or can be used as stand alone screens using flat feet. 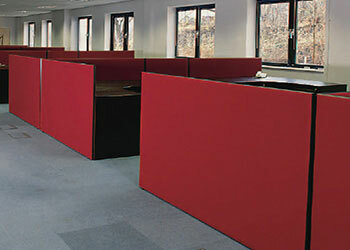 Used to reduce reverberant noise in open areas and screening of noisy office equipment. Screensorption can also be used to give acoustic isolation between workstations. 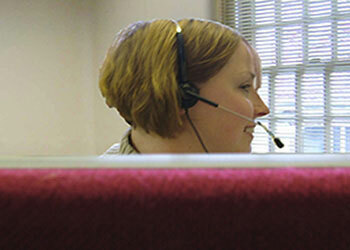 It is one of the most effective means for sound control in an open plan office or call centre. Screensorption acoustic screens are manufactured from resin bonded acoustic glass fibre specifically tooled and pressed for maximum sound absorption and are covered with an sound absorbent fabric with a high density wood based internal sound reducing core. A wide range of acoustic screen fabrics are available as can be seen from our Colour Chart with Aluminium or plastic posts and extrusions are available in four standard finishes: Black, Light grey, dark grey and brown. Other colours can be supplied subject to minimum quantities. Screens can be supplied in an infinite configuration of widths and heights to suit your specific building and furniture requirements and up to a maximum of 1800mm high by 1200mm wide. The nominal thickness of the screens 65-78mm depending on the style required. Other thicknesses may be available upon request. Note! This product will be made up according to the size and colour required from our range. Because this product is tailored to customers requirements, we cannot offer any refunds for its return.